Posted in Connect on October 3, 2017. The Wild Honey Inn in Co Clare made history on Monday, when it became the first pub in Ireland to be awarded a Michelin star. The pub, in Lisdoonvarna, Co Clare, is run by Aidan McGrath and his partner, Kate Sweeney. The couple, originally from Belmullet, Co Mayo, accepted the award with their daughter Levi (29) and son Reece (18). 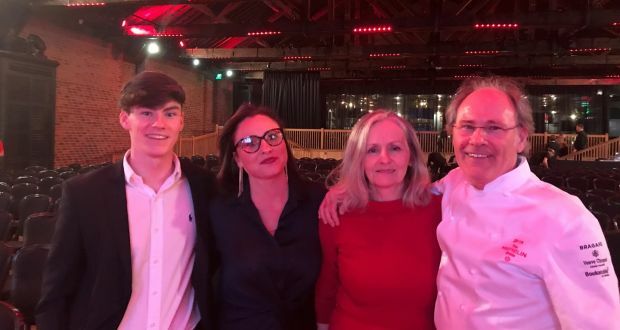 McGrath told the audience at the Michelin Guide to Great Britain and Ireland 2018 awards ceremony in London that he was “stuck for words”. He said he and his team had worked “quite hard doing this,” buying the former railway building “in bad times”. “This is great news for our family and the people that supported us, ” he told The Irish Times after the ceremony. 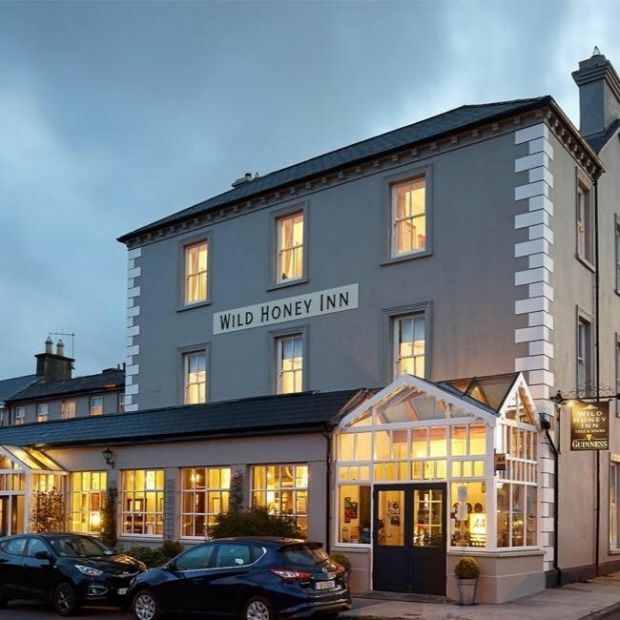 The Wild Honey Inn in Lisdoonvarna, Co Clare becomes the first pub in Ireland to be awarded a Michelin star. His menu draws on food from the Burren, seafood from the nearby Atlantic coastline and smoked salmon from Birgitta Curtin’s Burren Smokehouse. His ham hock terrine is a brilliant pub classic, long simmered ham hocks mixed with shallots, gherkins, capers and parsley and pressed into a loaf for slicing with celeriac remoulade. Of his decision to offer a higher standard of fare than normal pub grub, McGrath told The Irish Times: “We started off not doing what we do now, obviously, we were in a bit of a tailspin with the economic climate. The Mayo man began cooking in the Berkeley Hotel in London and worked in hotels in France and Switzerland. He became head chef at Marco Pierre White’s L’Escargot and returned to Ireland in 1992 to become head chef in The Limerick Inn Hotel. He opened his own restaurant, Muses, in Bunratty, Co Clare in 1999. Later he left Clare for Kerry to take over as head chef at the Sheen Falls Lodge in Kenmare and moved from there to Doonbeg Golf Club, now owned by US President Donald Trump. Sweeney and McGrath opened the 14-bedroom Wild Honey Inn in a former hotel, then known as Kincora House, in 2009. 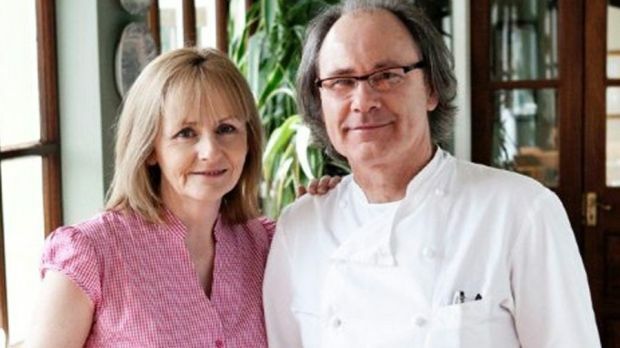 They were the subject of RTÉ show At Your Service in 2009 when hotelier Francis Brennan advised them on how to make a go of their hotel and gastropub venture. “We had a huge amount of work to do on the premises – it took us six months to do it,” he says of the venture. “I am classically trained, and I like the old-school cooking that would be the fundamentals behind what I do. I have always looked at classic food in a lighter way and modernised where I can and left it alone where I don’t need to touch it. And while the business grew, and McGrath’s cooking drew praise, it wasn’t enough to give him year-round business in the Wild Honey Inn. The Bib Gourmand and close proximity to the Wild Atlantic Way couldn’t keep visitor numbers up over the winter and McGrath took the decision in recent years to close his doors at the end of October and open again in March, leaving the inn and restaurant dark for four months of the year. The pub only started taking bookings this year. “When we started to take bookings, we did less numbers because we only have 12 tables. Ireland is very difficult to manage from a bookings point of view, you get a lot of cancellations and people don’t turn up, unfortunately. “Thats why we didn’t do booking for the last eight years – people used to queue up and come in. But its tricky now with staffing kitchens. We made the decision that we needed to go a bit smaller and be more in control because its hard to get people. McGrath said he was aware of one Michelin inspection during the year, but was not aware of a second visit (which is required to award a star). The Wild Honey Inn stopped doing an a la carte menu at the end of last year. “We do two set menus now, separately priced. Depending on what we have on it’s €40/€45 and €50/€55 depending on the cost of the ingredients. Asked what effect the Michelin star will have on his business, McGrath said “We’ve 14 bedrooms and that’s a huge part of the business – it keeps us going. There’s a bit of relief there [winning the star], for me anyway, and hopefully it will change how people look at us. Kate Sweeney added: “People come for the food anyway, and come to stay. People like what we do, and I don’t think anything is going to change”. McGrath continued: “We have no plans to change anything, we’re going to stay the way we are. I’m not getting any younger. I’ve been cooking for a long time – 33 years. but I still enjoy it. You’ve got to like it, the hours are horrendous. Italian Trifle, our version of tiramisu. Chocolate Fondant, blood orange sorbet, hazelnut. Irish Farmhouse Cheese: Gubeen, Durrus, Coolinatin cheddar, Cooleeney, Mileens, Crozier Blue – Choose two with crackers, chutney and apple membrillo.